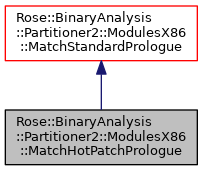 Matches an x86 function prologue with hot patch. A hot-patch prologue is a MOV EDI, EDI instruction followed by a standard prologue. These are generated by Microsoft compilers. Definition at line 42 of file ModulesX86.h. Definition at line 44 of file ModulesX86.h. Definition at line 45 of file ModulesX86.h.